It wasn’t long after meeting Fabio Salerno that I knew we’d be friends for a very long time… he offered me a tequila shot within seconds and complimented my shoes(albeit sarcastically since I was wearing flops at the time). He’s also Italian, with a capital “ITALIAN” so you expect a measure of vitality and vigor in his demeanor but that would be the understatement of the century. Fabio’s passion for what he does and those he cares about is readily apparent in every facet of his being. Even to go so far as founding The 11 Foundation for a close family friend who suffered a traumatic brain injury while snowboarding and has since made a full recovery. In addition to being an extremely successful restauranteur and an incredibly talented chef he’s a proud father and devoted husband. When I first brought up this shoot idea to him about 8 months ago he laughed, called me crazy and sorta brushed it off, clearly there is something to be said for persistence. Over the course of the summer I slowly wore him down over tequilas and beer until he finally agreed to letting me boil him alive in marinara sauce… Nearly 50 gallons of marinara sauce!! 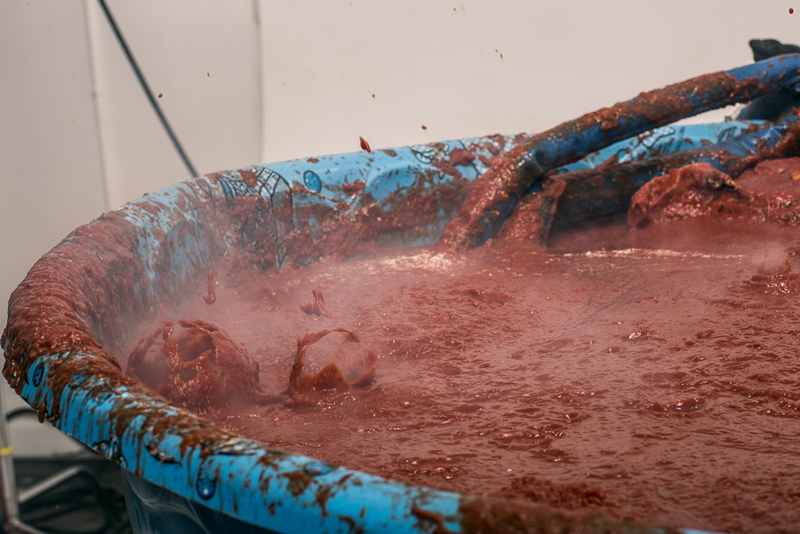 Above: What 50 Gallons of bubbling marinara sauce looks like… in a babypool. Production began with a few crude sketches and talking over how we wanted the image to feel. We knew right off the bat that we wouldn’t be able to take care over every element in camera at once so I immediately consulted my composite ninja Jason Feiler on how to best pull off what we wanted. We landed on two separate shoots, one at Fabio’s downtown restaurant Lago East Bank in the Aloft Hotel and the other here in the studio. Shooting the background or “plate” was straight forward enough but gathering enough information for Jason to work with forced me to do a panoramic style image in a tight space. Shooting in this way left me with a good amount of distortion on the corners so I was sure to shoot much wider than I would actually need to so I could crop into the less distorted center for the final plate. Halfway through the creation of the background we realized that we wanted more of a balanced feel and decided to mirror the stoves on one side to the other. That was definitely a Jason problem… but one that he buffed out rather nicely I’d say. 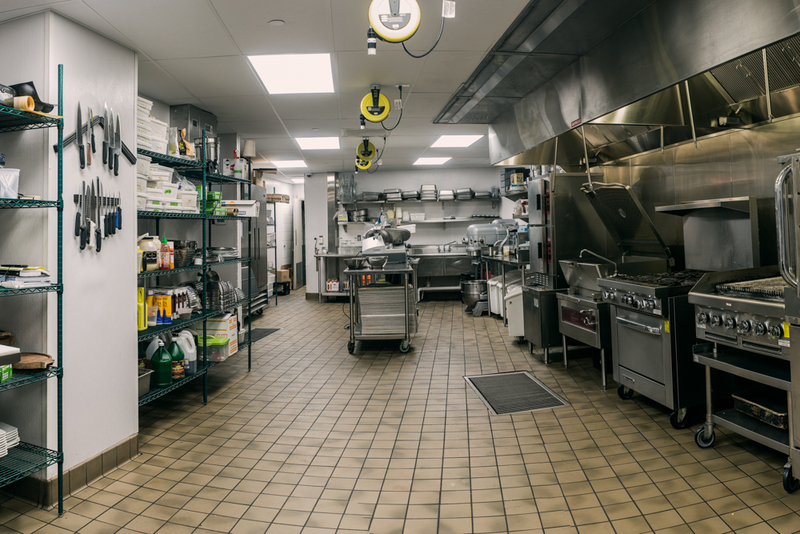 Above: The beginning of the “plate” we used to stage the scene, also the actual kitchen of Lago. Now that the plate has been completed the real fun began. Tracking down the veggies, pot, and props was actually easy enough since Fabio just let us go prop shopping in his kitchen and he often has that much marinara sauce on hand anyway. Our biggest challenge was going to be getting the marinara sauce to bubble and boil in a believable way(you can watch that struggle in the BTS video at the bottom of this post). This was left up to my always handy/ingenious art director Alex Piotrowski. After a little bit of trial and quite a bit of error we landed on a bucket topper shop vac and some dry ice attached to set of 4 way PVC valves and hoses that could be individually adjusted. This wonderful piece of ingenuity and duct tape was referred to as the boilermaker. They had to be adjusted individually since the airflow creating the bubbles would change depending in the length if hose it was attached to creating havoc on set… Oh the joys of boiling people alive. Above: Clearly Alex Piotrowski has no problem getting his hands dirty adjusting his boilermaker. It was imperative to Fabio that we include his family since he rarely does anything without including them. 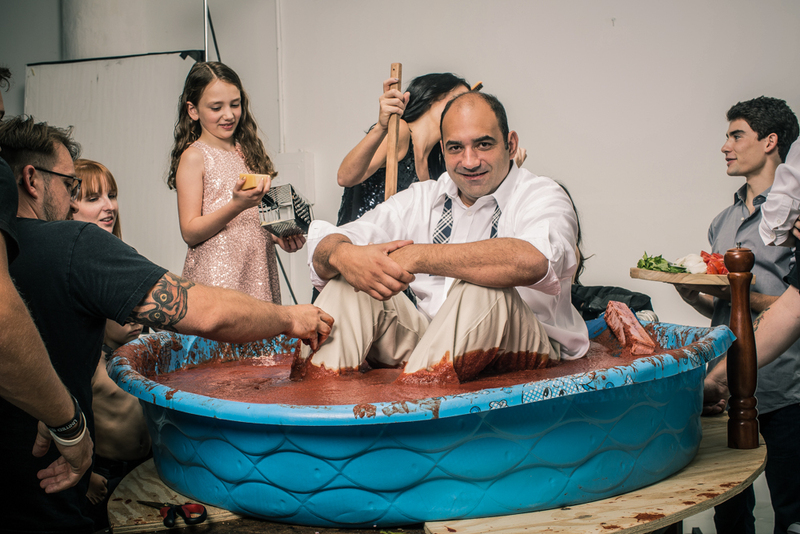 Nicole, Dominic, Sofia, Gianni and little Luca were all in attendance and having quite the grand ol time watching their father take a marinara bath. Wrangling everyone into position wasn’t too difficult a task (Luca may have taken a bit more effort). With all the hardware, props and people in place the actual shoot didn’t take very long, in fact after about 25 frames I knew that I had what I wanted/needed. The Raw capture may not look like much but the main point of shooting this way was to gather as much information as possible for my post-production guru Jason to work with. (Control your histogram… don’t let it control you.) You can see the raw capture below. Above: Our RAW capture for the final composite. Now out of my hands and into Jason’s the composite work can begin. 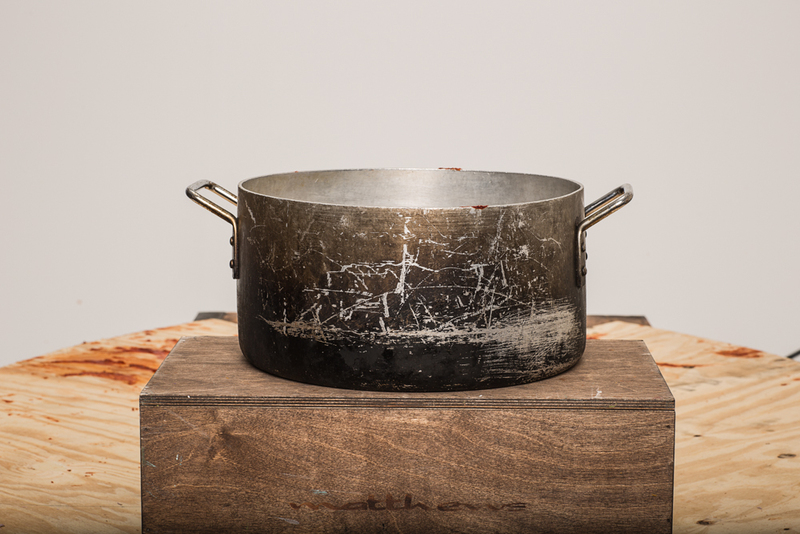 I had taken a few detail shots of the bubbling marinara as well as some texture shots of where Fabio and the sauce met as well as taking the image of the pot he would eventually be in. These would be used to enhance some of the finer textures and details if we needed to. Above: The final pot for the composite work. After the set was broken down, the lights packed up and the tarps tossed, we were left with a pretty remarkable image of a truly remarkable man. It was an absolute pleasure to work with you Fabio and I’m honored to call you a friend. Above: The finished composite image. To Fabio Salerno for being just crazy enough to even entertain the thought of this shoot. Nicole Salerno for making sure that this actually happened. My producer Julia Toke for keeping all the pieces and parts well oiled and on time. My stylist Maggie Kleinman for making sure everyone looked their best… even Fabio. 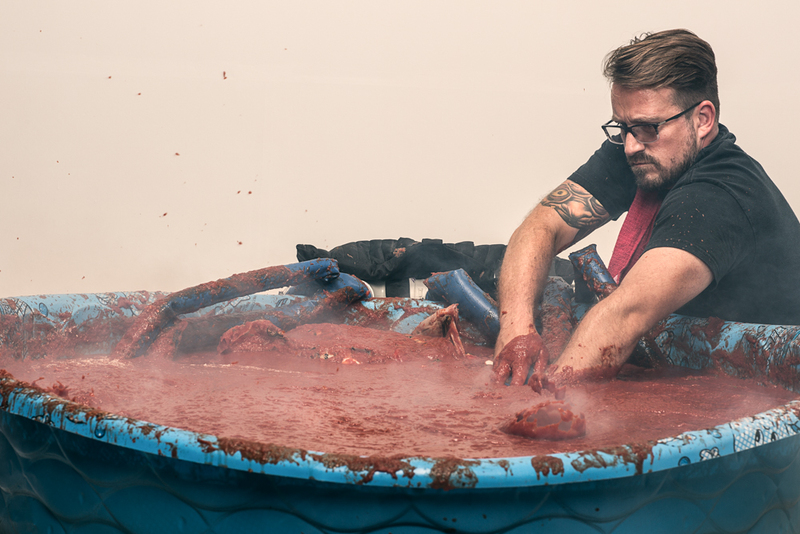 To my swiss army knife of an art director Alex Piotrowski for not being afraid of getting dirty… or weird. To my photoshop ninja Jason Feiler for his post production wizardry. And to my trio of trusty interns Molly Phillips, Brandon Andersen and Jordan Reynolds who are now all professionals with a mop. Main Light Power Source: One Profoto Pro-B3 1200 AirS Power Pack split evenly. And we were lucky enough that my multi talented intern Jordan Reynolds managed to keep his aversion to all things marinara(which I for one don’t even come close to understanding) in check long enough to make this Behind the Scenes video so you guys can see how it all went down on shoot day.